We used to use our Dyson DC16 all the time, but after it chewed through 2 batteries to the point you couldn’t get anything more than 15 seconds of continuous use from it, we decided it was too frustrating to use. It has sat in the attic for 2+ years, and now that I am making a lot more mess in my office, I figured it’d be a good project to do, as i’d get a useful vacuum cleaner out of it. 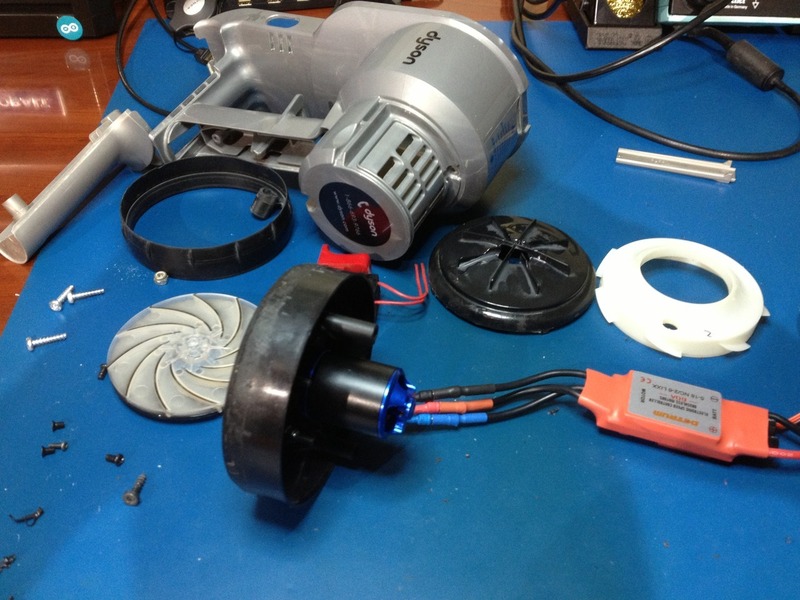 I pulled it apart (not so carefully), and have installed a 60a 3000kv brushless motor in place of the large chunky brushed motor it had. I am currently waiting on a “prop shaft adapter” which will take the 4mm motor shaft up to 6mm, which will be a nice snug fit for the centrifugal fan component. Im curious and also a little scared as to how this thing will perform… or whether it will just spin itself to pieces, on 3s lipo we’re taking 33,000 rpm or so, I was thinking of using the 5s lipo i have which is ~55,000 rpm.